Original size is 2666x2000, PSD is 115MB. Resized to 1600x1200, jpeg saved with 100% quality. The female scan looks really nice and the butterflies work very well in the middle strip. nice wallpaper, the chara looks good and i like the buterflies in the middle too. It's Ritsuka! So cute! Love him in the picture! It's awesome for your first wallpaper! The butterflies are so pretty! They add a great touch! Wonderfully done! Keep up with the great work! Quote by Aa-chanThe female scan looks really nice and the butterflies work very well in the middle strip. Umm.... Ritsuka is a guy. Anyway, I really like this wallie, I'll fav it! Owww..... I love the butterflies in there and the scan is great! Adding to favs! I like wallpaper keep up the good work! I'll put this in my favs!!! Thanx for sharing your work!! The only thing I could say is - try making the starfield (if it's a starfield, ee~ ^_^') a little bit more random and sparce? Vary the stars' colours like you've done with their opacity (red, blue and yellow stars, ne?). But that's just a tiny, tiny thing. XD And.. hm, maybe lower the thickness of the stroke on the bg text? ^_^' <-has a problem with stroke that's thicker than the lineart of the character (just a personal opinion, heheh). Ee~ overall, a great wallie. ;) Looking forward to more of your stuff in the future! i don't know how to make a good wall (I draw :)) And I admire those who makes wallies! Na, latom, kitort a Loveless mania :D, en is nezem, a wall is tok jo, tetszik a stilusa!!! azok a lepkek, nagyon szepek, mivel csinaltad? Huu, kedvet kaptam egy loveless wallhoz, de nem hiszem, hogy hamar lesz belole valami, mert tanulnom kell mint a guzu....na szoval tetszik a wall!!!! Wow! This wallie is absolutley beautiful! 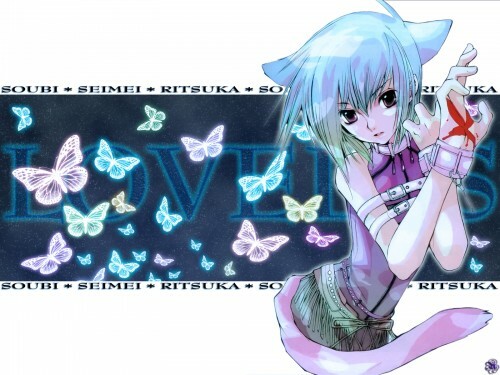 I love the butterflies ^^ hihi.. Ritsuka looks kind of girlish though.